First of all my apologies, I haven't blogged for ages I haven't even visited the craft forum for weeks. I have been busy though, I am writing a series of e-books to compliment my website.This has left me hardly any time do actually do much craft work. I had a fibro flare a few weeks back and decided I'd better try and get the e-books I have planned written before another bad flare comes a long. Enough about me I had to tell you about my new tote bag that Caroline from Redneedle Sewing made for me. Have a look at Caroline's shop Redneedle on Folksy she has some gorgeous items for sale. I have had to use a wheelchair to go shopping for over 3 years now. I have been looking for a pretty shopping bag that would fit nicely over the handles of the wheel chair. After a few emails back and forth Caroline was able to make the bag in the most gorgeous fabric for a very reasonable price. The bag is lined and has an internal pocket and and outside pocket.The nicest thing is she was able to redesign it so the handles are on the side, they fit over the handles on the wheel chair and the bag isn't all twisted like all the other shopping bags I've seen. The photo isn't great but the bag is perfect.Thanks again Caroline from one very happy customer. I'm having a break from writing so I hope to have some of my own makes to show you next week. I'm off to Wendy's blog to check out all the other Handmade Monday posts. If you love crafts do join me as you will find loads of lovely makes and crafty stories. Maria, that bag looks as though you could fit an awful lot of crafting goodies in there when you go shopping, fabulous floral fabric, too. First, I'm sorry you have not been feeling well, I can sympathize, it's so difficult but hopefully you will be feeling better for awhile. Second, what a lovely BIG bad! Awesome! Hugs and <3 for you! Now I'm curious about the e-books! Great bag. Fits perfectly too. I must pick your brain re e book. I have one ready to go, was going paperback but can't afford it and can't get my head round the virtual ones. I think the craft shops will be my first shopping trip with my new bag. Carol contact me through my site and I can go into more detail on what I'm planning to do with my e-book. I will also be looking into self publishing and will let you know what I find out. Exciting news about the ebook. Hope you're feeling better - headaches are awful too, I know. The bag is superb and it's amazing what difference just moving the handles can make. I think there could be a market there for Caroline! Maria thanks for the mention and of course the opportunity. Great project to work on and I'm thrilled it's fit for purpose. The best kind of sale: - a happy customer and a happy maker too! Hope you're feeling better now. 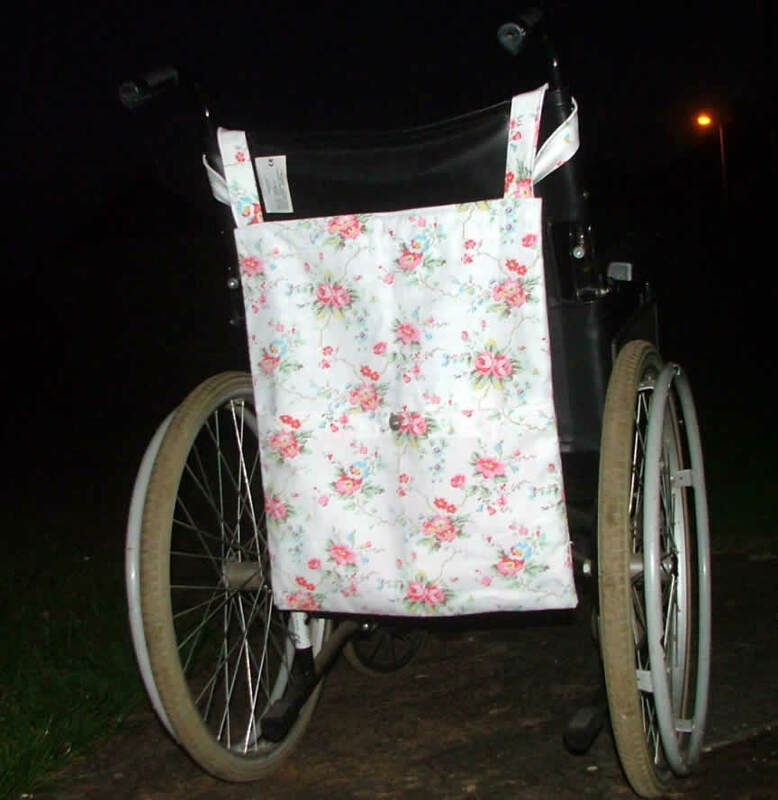 The bags a great idea, and adds a bit of Country Chic to a very utilitarian piece of equipment! Caroline has done you proud with such a super bag. Looks quite at home in its new place and am sure will get a lot of people asking questions when you are out and about. Hugs Mrs A. Love the fabric, looks great hanging on your chair. E-book sounds interesting, the bag looks great! Caroline's work is lovely and the choice of fabric very, very pretty.